I am dog sitting in Rainbow, CA at a house that sits on top of a large hill surrounded by grapefruit and orange trees. It’s very peaceful up here. Adding to the awesomeness is an enormous front porch that looks out over an incredible view. I am so grateful to have this change of scenery, and get paid to be here too! The owners are into bird watching so there are feeders all along the front porch and if you sit in the large, comfy wicker chairs you’ll get buzzed by hummingbirds and orioles as they come in looking for a snack. The hummers are especially fearless and will come right up to check you out face to face. Hummingbird food is sticky, sugary stuff, as you might know, and yesterday when I went outside to enjoy the sun I saw that ants had amassed to form an amazing number of marching lines up the banisters, across the roof, and down onto one of the feeders. It looked like the entire hill had come to party. They were everywhere! (I wonder if that’s what aliens think when they look at our planet… “OMG! They’re EVERYWHERE! Get the hose!”) The second big red restaurant had no such problem. 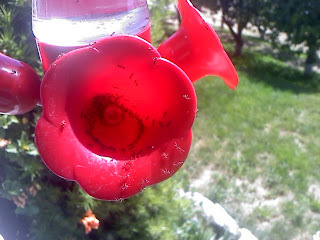 I found it especially interesting to see that inside one of the plastic “flowers” the ants had actually lined up like cars around a lake and were gulping it down (one would have to assume since you can’t actually see an ant gulp). I wish I had a better camera for these kinds of things. They looked like DNA all side by side like they were. I retrieved a glass of water to remedy the situation. As I poured it into the umbrella (apologizing for my “act of God”) there was panic, confusion, and drowning. A few good swimmers made it to the edge. I realized that those stuck on the part of the feeder under the umbrella would have no way off the fixture. I wondered if they would just wander around until they died of starvation or what. How long would it take those with an escape route to pack their things and go home? Would there be stories of ant heroism on the Local Insect News that night? Would web sites be set up to list the missing ants and hopefully connect them back with their families? Would this go down in history as the Great Flood of Saturday? What’s the average ant lifespan anyway? Would they even have time to do all that? Then I realized that all the ants stuck on the wrong side of the water could easily escape if they had the mind to. I knew this because I remembered there is no terminal velocity* for an ant. Well, there IS technically since “terminal velocity” means that fastest rate at which an object will fall – for ants it’s 4 MPH. (You’re welcome.) What I mean is ants don’t die from falling off high places like people do. Actually no one dies from the falling, it’s the sudden stop at the end that gets you. An ant, however, has so little mass that it can hit the ground from any height and walk away unscathed (or perhaps with a slight headache). No parachute required. All they had to do to return to safety was LET GO. Does the soul have mass? **Perhaps "TV" is also the fastest method to fall out of consciousness. Coincidence?